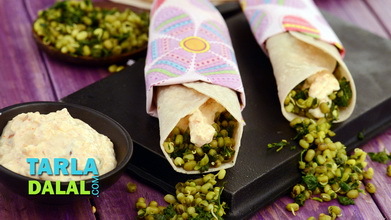 A filling and wholesome snack that is ideal for an expectant mother to satiate small hunger pangs. 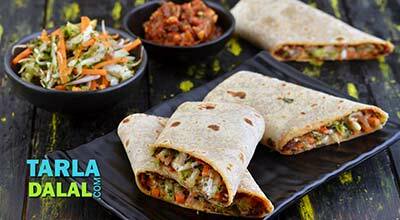 With abundant nutrients, such as protein from bean sprouts; as well as antioxidants like vitamins A, C from broccoli, carrot, capsicum and lettuce, the Bean Sprouts and Veggie Wraps will also help meet the growing nutrient requirements at this stage. 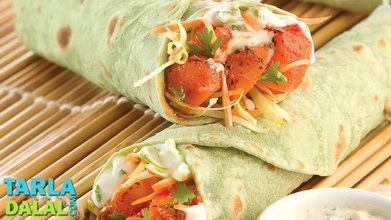 All these ingredients are also fibre-rich, which makes the dish easy to digest and more satiating as well. We have made the snack all the more healthier by avoiding store-bought mayonnaise, and using a quick and healthy homemade version instead. 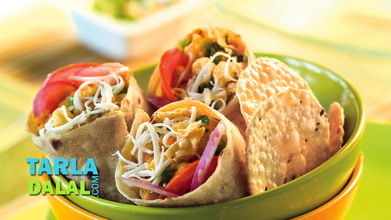 You will enjoy this snack, which is sure to chase away your hunger! Heat the oil in a broad non-stick pan, add the garlic and onions and sauté on a medium flame for a minute. 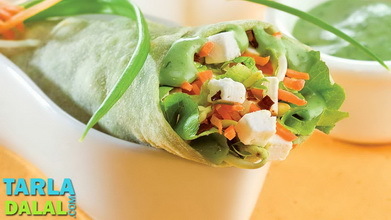 Add the capsicum, carrot and bean sprouts and sauté on a medium flame for another 1 to 2 minutes. Add the broccoli, chilli sauce, salt and pepper, mix well and cook on a medium flame for 1 minute, while stirring continuously. Remove the crust from all the bread slices. Combine all the ingredients including the bread slices and blend in a mixer till smooth. Refrigerate it for 1 to 2 hours and use as required. 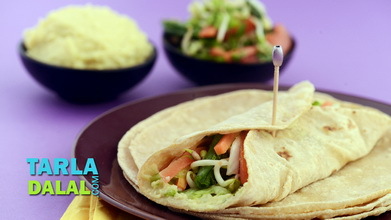 Heat a non-stick tava (griddle), place a chapati on it and reheat it on a high flame for a few seconds. 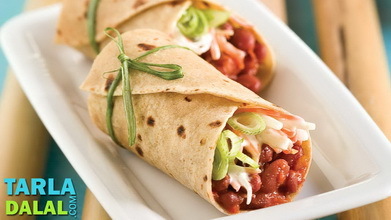 Place the chapati on a clean, dry surface and spread 1 tbsp of healthy mayonnaise evenly over it. 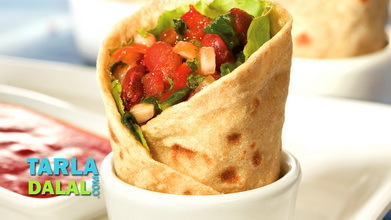 Arrange ¼ cup of lettuce leaves evenly in the centre of the chapati and spread a portion of the stuffing evenly over it. Roll it up tightly and seal it using a toothpick. Repeat step 1 to 4 to make 3 more wraps.